Tajima Wagyu from the JBS-owned Andrews Meat Industries in Sydney has claimed top honours in the 2017 Wagyu Branded Beef competition. 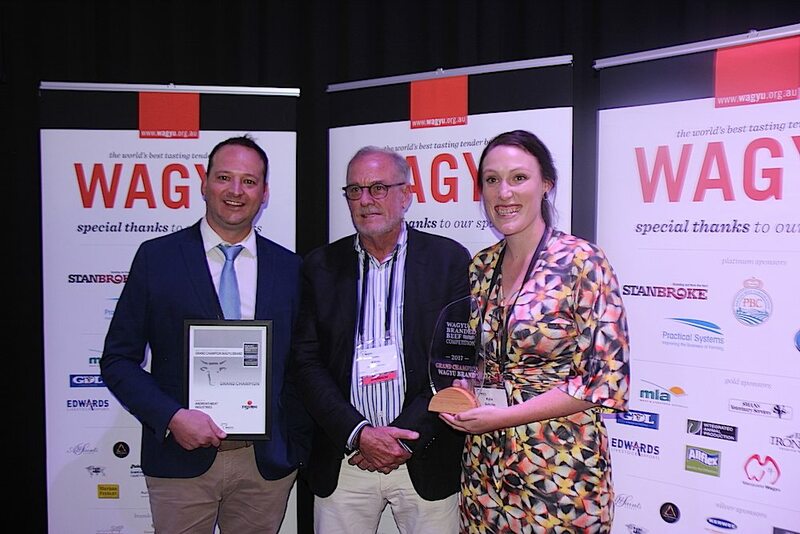 Twenty one premium Wagyu entries in four classes were assessed by a panel of 16 judges in mid-March, with the winners announced at a gala dinner during the Australian Wagyu Association’s annual conference in Albury on Tuesday night. The four classes judged were Fullblood, crossbred, commercial steak (mid marbling range) and gourmet sausage. Entries are judged on standard sensory taste panel criteria including tenderness, flavour, juiciness and overall liking, as well as visual raw state. Entries had to score a minimum percentage of total points on offer in each class (which varied for each class) to qualify for a gold, silver or bronze medal. Of the 21 entries from around Australia, three earned Gold medals, six Silver and seven Bronze. Five did not receive sufficient points to earn a medal. An entry from Andrews Meat Industries’ Tajima Brand, produced from an F1 Wagyu-Angus, scored 773 points out of a possible 910 points to win the crossbred class. As the highest scoring entry of the first three classes, Tajima Wagyu was also named Grand Champion Wagyu Brand. 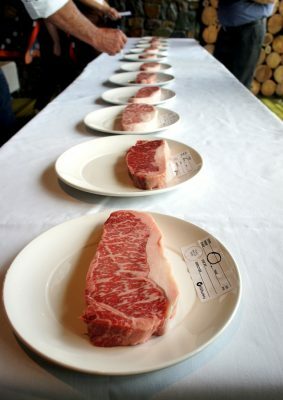 Tajima also claimed the Wagyu beef class at last year’s Brisbane Royal branded beef competition, and scored a silver medal at the equivalent Sydney competition. All cattle for the Andrew Meat Industries program are fed at JBS’s Prime City feedlot at Griffith in southern NSW. The product is sold into the upper end of the food service and retail segments in Australia and overseas. JBS Australia took a majority stake in the Andrews Meats value-adding and portion-cutting business in Sydney in July 2014. Andrews established its Wagyu brand programs – Tajima for crossbred cattle and Shiro Kin for Fullbloods – prior to JBS investment. The two other Gold medals were both awarded to AA Co’s Westholme brand, with winning entries in the Crossbred Wagyu class (748 points out of a possible 910) and the Commercial Wagyu Steak (Marble score 5-7) class (671 points out of a possible 910 points). Craig Cook’s Prime Quality Meats in the Gourmet Sausage class (1159 points out of a possible 1600 points). Wagyu Content: F1 – 50% min. Feed ingredients: Raised on natural grasses. Finished on a ration including wheat, sorghum and molasses. Andrews Meat Industries’ Jeremy Stuart and Kylie Schuller, with judge and sponsor John Kilroy of Cha Cha Char, Brisbane. Andrews Meat Industries director Jeremy Stuart said the winning entry was hand picked by Andrews’ Supply Chain Co-ordinator Kylie Schuller. “We picked one of the best pieces that we believe we have ever produced – the combination of the size of the eye muscle, the high marbling content – overall we think it was as good a piece as we have seen come through our production line. Mr Stuart said Andrews Meat Industries has about 7000 cattle on feed at JBS’ Prime City Feedlot at Griffith. It is processing about 500 cattle a month through JBS’ Riverina Beef plant at Yanco, and plans to increase these volumes. “So rather than just going out there and buying any cattle, we have kept the focus on the premium select genetics we have in these programs.